We are delighted to win the Cork Chamber of Commerce: Cork Company of the Year awards. Winning this prestigious award is recognition to the successful execution of the current phase of our strategy. This includes the delivery of our capital investments programme, finalising strategic partnerships with the knock -on economic benefits being delivered to the wider Cork region. All made possible, by the commitment and work ethic of the organisation’s many stakeholders. Dairygold is in the midst of change, sustainably growing our business, increasing employment and developing our people capability, while adapting to an evolving and volatile business environment. Our current capital investment programme of €215m is delivering a state of the art dairy processing infrastructure, enabling our Members to fulfil their on farm growth ambition, with a 25% increase in milk supply growth already achieved in 2 years, while also enabling the business to deliver “value added” opportunities globally. The Cork and wider Munster region is significantly benefitting economically from Dairygold’s success and growth, which will result in an additional €250m of economic benefit being generated per annum in the wider community. Through our acknowledged capability and leadership initiatives, we have attracted key strategic partners, to make significant investments in the Cork region, Ornua through the establishment of the Kerrygold branded butter centre of Excellence in Mitchelstown and Tine through the manufacture of its globally recognised Jarlsberg Cheese brand in Mogeely in East Cork. We are a strategically growth focussed, sustainable, ambitious, well invested, global reaching, indigenous Irish food and agri business. 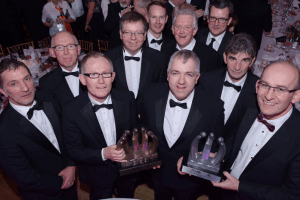 Members of the Dairygold Senior Leadership Team pictured at the Cork Company of the Year Awards.